I'm not going to lie to you and say that my 40 year old skin now looks like a 20 year old. That would take some serious surgery. As much as I don't love these lines on my face, I love the years I've spent earning them. It's a life well lived. That being said, I'm still going to try to hide these intrusions on my face. If there are any other gals out there like me who are bucking the system and refusing the Botox, then I have a great solution for you. It's the Clarisonic. And it is awesome. No need for you to defend your Botox, ladies. You look lovely. This is a totally different product, of course. The amazing girls at Sephora talked me into purchasing one. I didn't want to spend the dough and was sure it wouldn't be worth it. My friend Alison assured me it would be worth every dime. After a week, you couldn't have torn that thing from my hands. If there were one thing that I would swear makes a difference in my skin these days, it would be the Clarisonic. For me, it made my pores appear smaller and seems to help with the uneven skin tone that I have so dearly loved in my middle age. Sure, there are other things I use that probably help - but I think the Clarisonic is the key. In case you are wondering, this is one you can't replace with a lower costing brand. 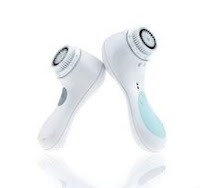 Another friend tried mine and swore the Clarisonic was different -- better. The germaphobe that dwells inside of me loves how clean my skin is. Because my skin only likes certain soaps, I continue to use my Clarisonic with my regular cleansers instead of theirs. Mine are inexpensive anyway. My biggest problem now is that my husband keeps stealing mine. I wish I were kidding. Remember that germaphobe reference? What's your favorite self-applied skin care product? Other housewives need to know! **As much as I would love to pimp my blogging skillz for Clarisonic, this post was for free. I wrote it out of love for their product. No compensation of any type was made for this review. But I wouldn't mind a free Clarisonic so I don't have to share with the Doc anymore. Just sayin'.